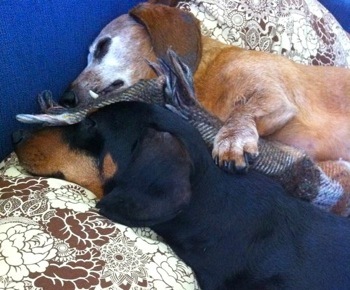 Soon after getting married in 2009, Charlotte Carnevale and Dave Willner added another family member, a dachshund that they adopted through the organization Muttville Senior Dog Rescue. Three years later, the dog has his own Facebook page and over 1,000 followers, not to mention a new companion, another rescue dachshund named Junebug. I am a foster mom for MWDR, Midwest Dacshund Rescue. My sister and brother in law own a family plumbing business in Menlo Park, Guy Plumbing. I live in a suburb 20 miles west of Chicago and my sister and brother in law have supported my love for the MWDR rescue net and Facebook for linking our little souls finding their forveer homes. Thank you. Barb.